Yesterday my aunt Ñica passed away in her beloved home in Miami Beach. She was in her nineties and holds a special place not only in my heart, but also in my family's history. Tia Ñica and her husband Jose immigrated to the United States in the 1950s and settled in Brooklyn, in the old Italian neighborhood clustered around the beautiful Our Lady of Loretto church, convent and school in East New York. One of 11 children to Galician immigrants to Cuba, not only did she herself become an immigrant to a new land where she did not know a single person, but also (I am certain), the first woman in her family to work. She worked in the factories that back then surrounded the neighborhood, and "after work", also worked babysitting the neighbors' children while their parents worked late hours. By the late 50s my aunt and uncle had saved enough money to buy a six apartment brownstone on Sackman Street, which is where they lived, and where my family and I landed in the 1960s when our family left Communist Cuba as political refugees during the "Freedom Flights" that allowed hundreds of thousands of Cubans to escape the political wrath of the Cuban dictatorship. 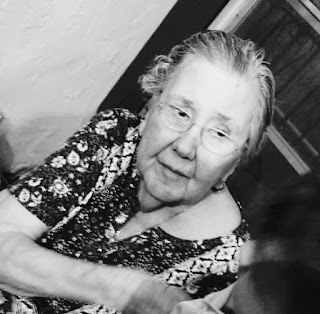 My aunt was a strong, powerful, opinionated woman, with a strong will and even a stronger, loud voice that could and would command attention in the chaos and cacophony of Cuban family dinners. For a few years, when I was a teen, I would accompany her after school, as we went door to door in Brooklyn selling oil painting portraits, where she'd send a photo to someone in Spain, who would then send back a pretty good oil copy of the photo! In retrospect, my "training" as an art dealer started back then! My aunt and uncle moved to Miami Beach in the early 1970s, and bought a gorgeous house on Alton Road surrounded by palm trees and avocado trees, and as a teenager my parents would "ship" me to them for the summer. I would always be picked up at the airport, and waiting in their house would be an ancient, retired Spaniard who would then give me a haircut and bring my hair length to my aunt's severe, anti-hippie standards, part of her belief that long hair, not wearing a watch, bell bottom pants and parting your hair down the middle, all contributed to moral corruption! Those summer months spent with my aunt and uncle remain as some of the happiest times of my life. But my strongest debt to this powerful gallega remains the fact that it was because of her and her loving husband, that my family was able to escape the living nightmare that their birthplace had become. And on behalf of your my children, and their future descendants, I send her a warm hug, and a most sincere "gracias" for all that she did, and the key part that she played in my destiny... and for all the love and support that she gave me through the decades: I love you Tia, and "teikyrissy" on Tio Jose!